"TASTE AS GOOD AS IT LOOKS!" If you are searching for a customized special occasion cake or treats.....Look no further! Custom decorated cakes are our specialty! Let us create the perfect cake to celebrate any event or occasion. 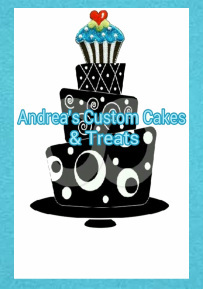 At Andrea's Custom Cakes & Treats, we specialize in making edible art uniquely designed with your vision in mind. We can create the dessert of your dreams, in both design and taste. From cakes to cupcakes we bring the "WOW" factor to your special day. Your guests will be in awe of the customized cake that was derived from your imagination and theme. Need help with your design? No problem, let us help! Our friendly staff is always available to help with designing a cake or answering any questions you may have. All we will need are colors, theme, invitations, and/or pictures and our design team will build a cake just for you! We pride ourselves on providing optimum and professional services accompanied with delicious products.